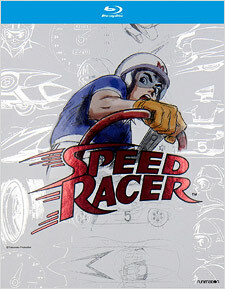 Speed Racer is the first TV show I can remember falling in love with as a child. I was born just a month after it debuted in syndication here in the States. By the time I was five, I was hooked, which meant running home from school each day to catch it on the local UHF station. One of the first Japanese anime to find crossover success on this side of the Pacific, its animation style was simple but effective, brilliantly colored, and packed with dramatic angles and perspective shifts. The series (known as Mach GoGoGo in Japan) chronicled the adventures of the titular young race car driver, who’s just emerged from teenaged obscurity to compete on the world stage. His vehicle of choice, the Mach 5, was built by his genius mechanic father, Pops Racer. It’s packed with enough high-tech gadgetry to make James Bond envious and, for some reason, Speed’s nosy kid brother Spritle is frequently a stowaway passenger in the trunk (along with his monkey sidekick, Chim Chim). Still, even with such a fast ride, and his girlfriend Trixie hanging on his arm in the winner’s circle, Speed’s life is far from simple. You see, there’s a rogue’s gallery of villains constantly gunning for him – guys like Snake Oiler, Captain Terror, and Cruncher Block. Making matters worse, Speed’s older brother Rex ran away from home years earlier, after a falling out with Pops. Fortunately, Speed finds an ally in a rival driver, the mysterious Racer X. Little does Speed know that Racer X is secretly... ah hell, if you don’t already have the rest memorized, you’re no fan of this show. Life long fan that I am, many decades have I waited for the chance to see the Mach 5 tearing up the track in high-definition, restored to its original Trans-Lux glory. Now that opportunity has finally arrived in the form of Speed Racer: The Complete Series on Blu-ray from the powerhouse U.S. anime distributor FUNimation. All of these episodes are presented in their original full frame TV aspect ratio here, as scanned from the original film elements. The result is as close to perfect as this series can ever be expected to look. Colors are rich and vibrant; they really pop off the screen. Black ink lines are dark, whites are bright but not blown out. Detail is generally crisp. There are physical film and animation process artifacts visible – little bits of dust and dirt, tiny nicks, and a constant wash of light film grain – but those are to be expected and never detract from the viewing experience. You’ll be glad to know that the series’ original white title card has been restored, as opposed to the spinning digital abomination Speed Racer Enterprises tacked on, though the Trans-Lux credit is still missing (that’s fine by me, as you get to see the opening Mach 5 animation better anyway). The English dubbed audio, the work of the late great Peter Fernandez and his voiceover team (which included Corinne Orr, Jack Grimes, and Jack Curtis) is presented in 2.0 mono in Dolby TrueHD format. Other than the occasional pop, the soundtracks are generally clean, clear, and in good condition. One quick note: The packaging also lists original Japanese 2.0 audio, but that’s an error. It’s not actually included on the discs, though you do get optional English SDH subtitles. (More on this subject in a moment.) In any case, this Blu-ray set offers a dramatic improvement upon the A/V quality of any and all of the previous DVD releases of this series. And if the last time you saw Speed was during its long TV syndication run, you’re in for a real treat. Truly, you have never seen this show looking so good before. This is a 5-disc set (coded to Region A according to the packaging), which includes all 52 original English episodes of the series. There are, however, no bonus features. That shouldn’t really be an issue, as there weren’t all many good bonus features included on the previous DVD releases either, whether you’re talking about the DVDs from Artisan/Lionsgate or the former Speed Racer Enterprises. But here’s the thing: The current Amazon price for this set is just $20. That’s a tremendous deal, given that the previous DVD volumes cost that much each and there were five in all. Now, as we’ve reported here at The Bits over the past few months, FUNimation also intends to release the original Japanese version of the series, Mach GoGoGo, on Blu-ray here in the States (in the original Japanese with proper English translation subs). We’ve spoken with company reps, who tell us that the plan is to release a deluxe BD box set later this year that will include both Speed Racer and Mach GoGoGo in the same package, the production work for which is still ongoing. I actually have an original Japanese BD set of Mach GoGoGo (it was first released in Japan back in 2012 – Region A, but with no English subs – and yes, that’s the level of Speed Racer enthusiast I am). Fans have long known that these episodes were edited back in the day for their U.S. release (generally, it was moments of excessive violence that were excised – especially gruesome car crashes and the like). I’ve now compared the running times of all 52 episodes, and have discovered that – allowing for differences in the length of the opening and closing credits (the Japanese credits were a minute longer) – most episodes were trimmed by 1-2 minutes (the average being a little over a minute each). Over the course of 52 episodes, that’s like getting 2 and a half more episodes’ worth of material. So it’ll be a real treat not just to finally see those longer versions unedited, but to experience the series with all the original Japanese dialogue properly translated and with its cultural context intact. I’ll tell you this much for damn sure: Having just watched about half of these episodes in preparation for writing this review, the Wachowskis really knew what they were doing when they adapted Speed into a live action film back in 2008 (see my review of that film here – and boy, do I wish Warner would release that film in 4K with High Dynamic Range). The Wachowskis really captured the essence of this anime perfectly. If you’re as much of a fan of Speed Racer as I am, you might prefer to wait for FUNimation’s more deluxe Blu-ray set later this year. But if you’re a casual fan, especially at just $20 for 52 episodes, FUNimation’s Speed Racer: The Complete Series is steal. It’s also a helluva lot of fun. Recommended.